20 students from the Faculty of Business were selected to become lucky ticket holders and received permits enabling them to attend The Glyndebourne L’ELSIR D’AMORE ‘The Lyric’ ‘OPERA’ at The Plymouth Theatre Royal on 4 December 2013 as part of the Plymouth Junior Chamber Partnership Programme. This unique opportunity gave the students insights into Theatre Business and a privilege to experience Opera. 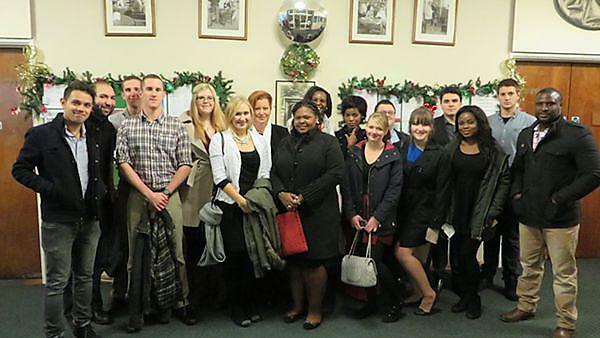 The students met for a Christmas meal at the University of Plymouth's Drake’s Café. Over the Christmas meal students from different schools within the Faculty introduced themselves to each other, giving all the lucky ticket holders an opportunity to network and to get to know each other. After enjoying the Christmas meal the group set off for a walk towards the Plymouth Athenaeum Theatre where they met the Theatre staff from Glyndebourne and received a pre-performance talk, gaining insights into theatre business. The students were given direct contact details to contact Glyndebourne Theatre staff if they required any additional educational support information regarding theatre business. “… can I just say thank you to all the people who organised this as it was the best thing event I have attended since joining the University last year”. how to use networking to help them find a job. The unique training opportunity started when the students arrived at the University of Plymouth's Drake’s Café. Upon arrival, each student was randomly allocated to a table and straight away the students started conversing with their fellow colleagues. After enjoying their meal, the group set off to the Roland Levinsky Building to meet the Networking Trainers. Kellie Forbes-Simpson spoke to the students about how university students secure jobs after graduation, exploring various methods and strategies that students could apply to enhance their future job prospects. Sybille Schiffmann applied a varied mixture of engaging and fun methodologies to deliver network training. Students worked in groups, watched videos about networking, received engaging lectures and held controlled friendly debates. Approximately 250 international and home students from the Faculty of Business have enjoyed time together undertaking team building activities at the Eden Project due to our partnership with the Plymouth Junior Chamber of Commerce. The students were divided into teams at the Eden Project and immediately engaged in a trade and build a den challenge under a time constraint – their creativity and trading skills were put to the test. After this demanding activity, the students enjoyed a hot lunch, giving valuable time for networking and group bonding.